We love a bowl of goodness that offers fibre-packed whole grains, greens, healthy fats and protein without skimping on flavour or texture. There’s such a huge variety of interesting grains available now: freekeh, farro, buckwheat, quinoa, barley and millet all have places in my larder. They’re great with seasonal vegetables, dark leafy greens and zingy citrus. Add a creamy garlicky dressing and a crunchy topping – toasted nuts, roast chickpeas or pomegranate seeds – and you’ve got yourself a very satisfying meal. The recipe below makes use of wheat berries. Ours were very kindly sent to us by the lovely people at Trenchmore Farm in Sussex (trenchmore.co.uk). They’re available in health food shops and online. They take a while to cook, but the results are well-worth it: chewy favour-some grains, packed with fibre. I’m a bit obsessed with fibre: I blogged about its longevity benefits recently here. In a nutshell: new research reveals that 30g of fibre a day can reduce the risk of death from any cause by up to 30%. Plus, it slows the passage of food through the digestive tract, helping to reduce blood sugar surges. What are your favourite whole grains? Let us know in the comments below! Rinse the wheat berries well and add to a saucepan of salted water. Bring to the boil and simmer for between 45 minutes and one hour. Test your wheat berries for done-ness – they should be soft on the inside (the outside will remain chewy, however long you cook them) and a few will start to split. Drain and rinse again. Season well and toss with the olive oil. Beat together the tahini, yogurt and lime juice. Stir in the garlic and herbs, season well. Add a splash of water if it’s too thick for your taste. Put the whole cucumber onto a chopping board and bash with a rolling pin (very satisfying) until it starts to crack. Pull into chunks with your fingers, discarding the wet, seeded centre as you go (I scrape it out with a thumb nail as I break the cucumber into chunks. 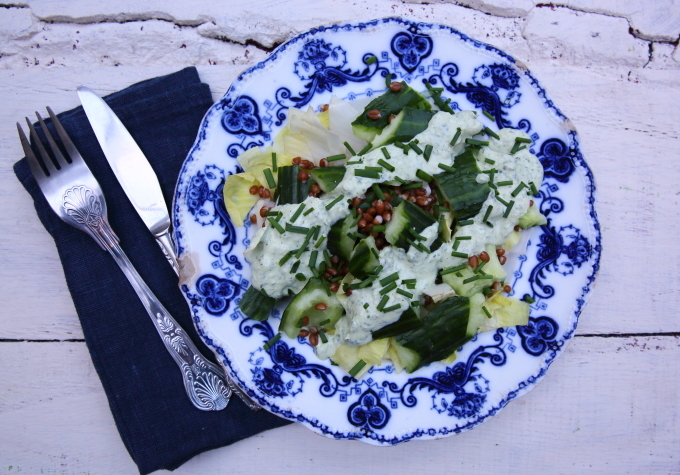 Put in a bowl or on a serving platter with the chicory and wheat berries. Drizzle over the dressing and top with chives. Add any protein of your choice: grilled chicken, crumbled feta, roast chickpeas etc The dressing is divine with pretty much anything: I make it all the time. « CAN YOU EAT TO BEAT POLLUTION? Can’t wait to make all of these. Thank you for putting together a few recipes for me!